On the 26th (Wed), look for all kinds of wild species at Lillico Beach Conservation Area, then stroll through Coles Beach, and then visit a coastal fixture at Mersey Bluff Lighthouse. To find reviews, traveler tips, and tourist information, use the Devonport itinerary builder . Melbourne to Devonport is an approximately 3-hour flight. You can also ride a ferry. Traveling from Melbourne in December, things will get slightly colder in Devonport: highs are around 25°C and lows about 10°C. You will have some time to spend on the 27th (Thu) before leaving for Bruny Island. Kick off your visit on the 27th (Thu): take in the exciting artwork at Forestvale Design Centre. Get ready for a full day of sightseeing on the 28th (Fri): shop like a local with Woodbridge Art and Craft Gallery, look for all kinds of wild species at Raptor and Wildlife Refuge of Tasmania, and then learn about winemaking at Bruny Island Premium Wines. To find more things to do, ratings, maps, and other tourist information, refer to the Bruny Island online trip builder . Traveling by combination of car and ferry from Devonport to Bruny Island takes 5 hours. Alternatively, you can do a combination of bus, ferry, and taxi; or do a combination of flight, bus, ferry, and taxi. In December, plan for daily highs up to 24°C, and evening lows to 13°C. Finish up your sightseeing early on the 30th (Sun) so you can travel to Cradle Mountain-Lake St. Clair National Park. On the 30th (Sun), examine the collection at "Wee Georgie Wood" and then take some stellar pictures from Devils Gullet Lookout. 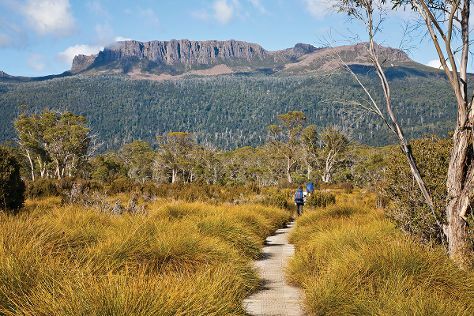 On the 31st (Mon), you'll have a packed day of sightseeing: look for all kinds of wild species at Westmorland Falls and then trek along The Overland Track. To find where to stay, traveler tips, reviews, and other tourist information, read Cradle Mountain-Lake St. Clair National Park trip itinerary planning site . Traveling by combination of car and ferry from Bruny Island to Cradle Mountain-Lake St. Clair National Park takes 7 hours. Alternatively, you can do a combination of taxi, ferry, and bus; or do a combination of taxi, ferry, bus, and car. Wrap up your sightseeing on the 1st (Tue) early enough to travel back home.